Like many couples with a young family, Judy Maclean and her husband David came to the Comox Valley 30 years ago looking for a quieter place to raise their children. In doing so they found a thriving arts community and a place for Maclean to turn a passion for the fibre arts into a thriving home-based business. Today, Maclean is the maker of Sweatermaker Yarns, producing hand-dyed, hand-spun yarn out of the basement of her Fifth Street home. Her product caters to the new generation of knitters, crocheters and crafters seeking color, diversity and high quality exotic fibre. Maclean came to the fibre arts almost by accident. Husband David started out as the artist in the family, studying Fine Arts at the University of Calgary in the 1970s. She worked in business. Together they spent a lot of time socializing in the arts community, and in Maclean met a group of weavers who took the time to teach her their craft. A six-week night course in hand-spinning soon followed. By the time the family moved to the Comox Valley, Maclean owned a loom, a spinning wheel, and lots of fleece. Sweatermaker Yarns was born. At first, Maclean focused her business on custom, hand-knit sweaters based on her yarns. She specialized in brightly colored, highly patterned sweaters in the style made popular by American comedian Bill Cosby in the 1980s. Many of those sweaters are still being worn today and can be found around the world. Maclean’s hand-spun was anything left over from her knitting designs. Maclean also couldn’t produce enough knitted goods to keep up with the demand for her work. In the end, hand-spun seemed easier. “Wool fits everybody,” says Maclean with a laugh. To differentiate her product from widely available commercial yarns, Maclean made the decision early on to use exotic fibres like alpaca, cashmere and silk and to dye her yarns in colors not readily available in the marketplace. Her yarn was a hit, especially in the Valley’s arts and craft community that already had an appreciation for small scale, artisan production. Maclean, however, was also a mom with small children, and most of her work was done in the hours after the kids went to bed. The result was unique, often one-of-a-kind yarns. But her product lacked the consistency needed to grow a business. “Knitters need consistency in their yarn,” says Maclean, adding that this is what helps the hobbyist knitter and crocheter turn out attractive handmade textiles like sweaters, socks, afghans and scarves. That meant making changes in how she made her yarn. For example, Maclean started dying her yarns in five-kilogram batches to produce large quantities in the same color schemes. Likewise, she started pre-weighing her fibre to turn out skeins with the same weight and meterage. Finally, Maclean sourced out a supplier of raw wool able to provide her with a consistent product from order to order. Another important decision in growing her business was to focus on production, rather than sales. “I really don’t have the through traffic to justify a storefront in my home,” says Maclean. “Besides, it’s a distraction from my work, and some of my best spinning time is at two in the morning. 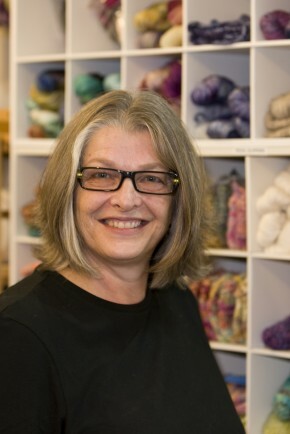 Instead, Maclean relies on the knowledge and expertise of local yarn stores to sell her product. Uptown Yarns in Downtown Courtenay, Fun Knits on Quadra Island and the Knit ‘n Stitch Shop in North Vancouver all carry Sweatermaker Yarns. Fun Knits also has an online shop that makes Maclean’s yarn available to any knitter with an internet connection. Maclean is also a regular participant at the annual Filberg Festival, an event that gives her direct contact and one-on-one time with the people that buy her yarn. And the feedback is positive. “My customers are from all age demographics and the only thing they have in common is a love of good fibre,” says Maclean. “The retailers who carry me tell me that overwhelmingly, the first reaction is always first to the colors. And then they are hooked once they touch them. There is just something about actually being able to touch the product. And that seems to be what knitters, crocheters and crafters are looking for. Maclean’s business has grown steadily in the last three or four years, with demand for her yarn increasing every year. However, Maclean is determined to stay small. “I haven’t pursued an online presence because I want to remain small and I am almost exclusively wholesale,” says Maclean when asked about plans for her business. “I think a website could result in demand that I am not prepared to meet. The yarns themselves have established an online following through knitter’s blogs, but to be honest, I believe my biggest sales still come from one-on-one sales in the stores that carry me. And that is something any knitter, crocheter or crafter can agree with. Judy Maclean and her husband David came to the Comox Valley 30 years ago looking for a quieter place to raise their children. Maclean is the maker of Sweatermaker Yarns, producing hand-dyed, hand-spun yarn out of the basement of her Fifth Street home. Her product caters to the new generation of knitters, crocheters and crafters seeking color, diversity and high quality exotic fibre. store Judy Maclean and her husband David came to the Comox Valley 30 years ago looking for a quieter place to raise their children. In truth, it wasn’t exactly a toss-up between providing safe and healthy haven for a little foster-child, and doing what she ultimately did, but it was close. Rather than fostering a helpless and possibly ‘wounded’ child, Lise Carignan took on a small group of metaphorically wounded adult men and gave them that haven. A haven that has, in its two-and-a-half years of existence, become a kind of metaphor for ‘safe’ recovery for a number of men. Welcome to the Bees’ Nest. What Carignan—who is frank and honest about the fact she is a recovering alcohol abuser with a number of years of good sobriety—realized as a virtual inspiration one day during a time of quiet meditation was that if people were given the opportunity to occupy a safe, sane and sober dwelling during that perilous period of early recovery, then they might stand a much better chance of returning to the realm of productive and sane citizenry. What she appreciated was that people coming out of a recovery facility often have no safe place to go. While the clients may have had 28-days (or more) of structured security while they travel through their first stage of recovery, there is a huge paucity of safe and inexpensive housing for these people as they move into their second stage of recovery. The lack of affordable housing in the Comox Valley (and other communities) is a grievous social ill and is yet to be solved. Carignan, however, had a house that she was either going to move into (possibly with that foster child), or that she might rent out, or that she could use to fill that safe housing gap in her own community. Fortunately for many, she chose the latter and she, her residents and the community gained as a result of that decision. But, the idea of being a single foster parent, she came to realize, was too daunting a prospect for somebody who was working full time at a stressful job. So, from that she moved on to the idea of helping people through second stage recovery. Carignan also candidly admits that in choosing the road that she did, it hasn’t been an ‘easy’ bit of traveling. Carignan says her goal with the Bees’ Nest is to aid the residents in getting steady on their feet. Carignan is candid about the fact she entered the Bees’ Nest venture quite oblivious to the trials and tribulations that were going to manifest. And manifest they did, with a vengeance, it seemed at the time. The first big test stemmed from something as prosaic as lousy weather and a bad drainage system in the less-than-new Courtenay house that had only recently become the Bees’ Nest. So, the drains backed up and it was a hideous mess that ruined the flooring in the ground floor area where the residential rooms were located. She was heartsick at the mess and wondered if she’d made a grievous mistake with the venture. She was in debt and knew she had taken on an onerous, possibly even impossible, task. And those were just the physical realities of the venture and had nothing to do with the residents per se. Just who are these ‘strangers’ she was letting take up residence on her personal property? They are males aged 19 or older who have either successfully completed chemical dependency treatment within the previous 30 days, or who have 60-plus successive days clean and sober. They must have a recovery plan in place and they must be doing all that is needed to maintain their newfound sobriety, such as attending 12-Step meetings and are totally abstinent from any and all drugs and alcohol. About this last point Carignan is adamant and unwavering. It has to be that way, she says, both for their stage two recovery, and also because any hint of use is distressing to other residents. Furthermore the residents, if they are not advancing their education, must be actively seeking employment. Added to which they must be able to participate in house activities and are responsible for their part of the rent each month. Carignan says she thought long and hard about many aspects of bringing the Bees’ Nest into being. While she had the house, there was still to be huge costs involved with needed renovations to render it a suitable dwelling for multiple tenants. She wanted grace and comfort within, and nothing resembling depressing squalor, because too many prospective residents came from such less-than-adequate accommodations. And then there is the unanticipated, such as the flooding and the expenses that dumped in her lap. Finally she was (at that point) going it alone and that led her to feeling a keen sense of isolation at different times. Those were the times when she wanted to just pack it in, but her resolve, her faith and her own recovery kept that from happening and she soldiered on despite adversity. Carignan readily admits that it hasn’t always gone smoothly, but she suffered no delusions that it would. She knows what the recovery process, with all its pitfalls, is like. And it is a pleasing environment with five comfortable and clean rooms, a good kitchen, a nice living-room lounge and meeting area replete with big screen TV, stereo and virtually anything most people would want. To Carignan’s delight her rather solitary and frustrating quest to make this thing work to the advantage of everybody, changed much for the better. A man with whom she’d long been acquainted came into her life, not only as a partner in operating the Bees’ Nest, but also as a life partner. She couldn’t be happier about that, at many levels. While Carignan has huge praises for Braun, she also has no small praise for her facility being in the same community as CVRC, the residential 28-day facility on Menzies Avenue in Courtenay that has long been a feature of the Comox Valley and is deserving of accolades in its own right. Why Bees’ Nest? In one respect that is due to a personal bit of philosophy Carignan has adhered to for a number of years, and she figured that the metaphor worked at a few levels, so she went with it. How long can residents stay at the facility? Carignan says that when she established the Bees’ Nest she set a cap of a year, working from the assumption that by the time a year was completed in complete sobriety and with a good recovery program, clients should be in a position to move on and let somebody new utilize the space. Today the duration of residency depends on the circumstances. She still holds to a year if the client has secured a job. She reiterates the fact that strict adherence to the zero tolerance of the house is the one thing that can keep the whole thing going. Carignan says she hates expelling a resident, but she is realistic about it. While she feels for their pain, she also is piqued by the fact that she loses the money they would have been paying to stay. After all, it is a business. As far as money is concerned, the Bees’ Nest has been a huge investment on her part and she can only express delight in how generous the Comox Valley community has been in helping her keep the place going. The testimonial list she would like to create would be huge, she says. But, as it stands she is overwhelmed by how the community has banded together to play a part in helping to solve two serious problems—addiction and the lack of safe housing—in the Comox Valley. In that, she cites the case of one group of businessmen who made an anonymous donation of $1,000 for the facility. Over the two-and-a-half years of the Bees Nest help of many kinds has also been received from (in no particular order): Pilon Tool Rental, Home Depot, ReStore, the Salvation Army, Torry & Sons, AHERO, Wachiay Friendship Centre, Alano Club, Shamrock Veterinary Clinic, Comox Valley Recovery Centre, Bob (The Builder) Dehaas, Mike Claire, Tracy Forbes, Corix Water Products, Lee Gingrich and SD 71 students, Second Chance Recovery Centre, Ronni Lister (Remax), Grasshopper Graphics, Andrew Sheret Ltd., Bartle & Gibson Co., Complete Auto Care, Highland Precast, residents of the Bees’ Nest, the Comox Valley Homelessness Commission, Rod Braun, Ian Lidster, Gary and Stan Pawlak, and numerous volunteers and anonymous donors. “The Bees’ Nest wouldn’t have continued to exist without the help of all those mentioned,” Carignan says.